happenings of our home: Girls Day & Day at the "K"
Saturday, the Briles gals (well, 2 Briles, a Korb, & a Yoakum) had a Girls Day Out! 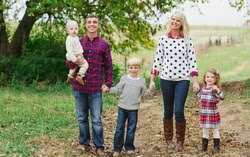 It has been planned for quite some time, & we were all anxiously awaiting our day together! We can always plan on laughter, silliness, & movie quoting when we all get together--and there was plenty of each!!! 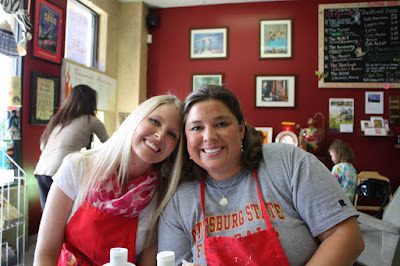 We started our day by having lunch at Elephant Bar & then we headed over to paint some pottery! 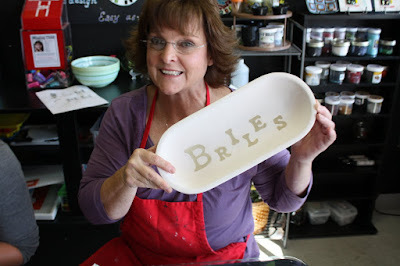 The pottery place was poppin'! Apparently, this is THE place to have a birthday party if you are a 5 year old little girl. There were five different birthday parties while we were there! Luckily, we weren't the only ones being silly, giggling, & on occasion, getting a little rowdy (Auuuuubry!!!)! 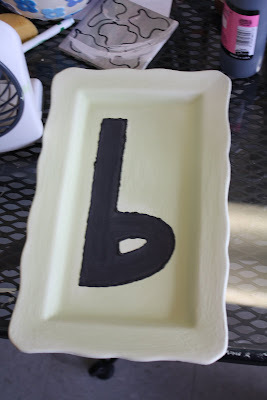 We spent some time choosing the perfect pieces to paint, & spent even more time painting & decorating them. Some of us spent wayyyyyy more time than others (Janelle & those stinkin' polka dots! Just kidding--you know I love ya sister). 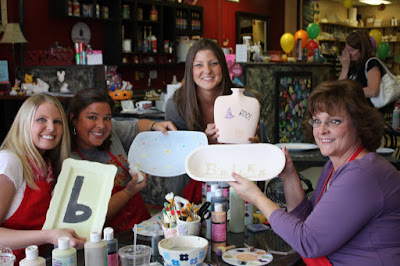 It was a great day, & we are already planning our next Girls Day Out- at the spa!!! Can't wait for that! Sunday, we started our new Adult Bible Classes at church! So exciting! I honestly didn't think that our church could feel more like a "family" than it already does, but I was proved wrong! Jared & I both agreed that we both left feeling so much more "connected" to everyone after the changes on Sunday! We are thrilled to be a part of a changing, growing, exciting church body, & even more thrilled to see how God will use it (& us) for His glory! After church, we came home & let the Jett Man take a long nap. 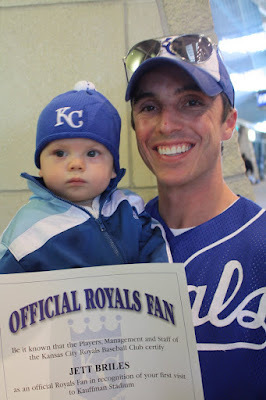 Then we headed out to do what DaddyBoy has waited his WHOLE life to do-- take his son to a Royals game. Jared has been dying to get Jett to a game this season, so finally we squeaked one in! We made it to the very last game of the season (nothin' like waiting til' the last minute, huh?!) Honestly, I am so glad we waited! The day could not have been more gorgeous- the weather was perfect & the crowds were small. 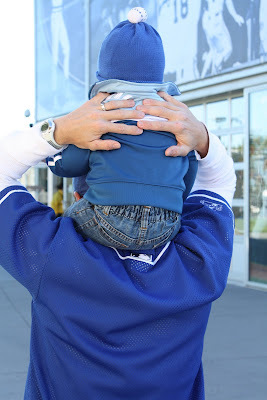 We watched the game for a little while, but spent most of the day entertaining Jett & taking him around to see all the fun to be had at the "K"! It was a perfect day, full of wonderful memories that we will never forget! It was especially meaningful to Jared. 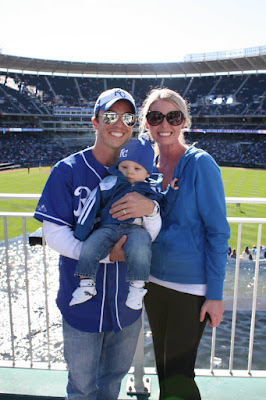 He is a Royals fan, & an even bigger Jett fan, so to have them both at the same time- well, let's just say he was right in his element! I am so excited for my boys to get to make many more memories going to ball games together. 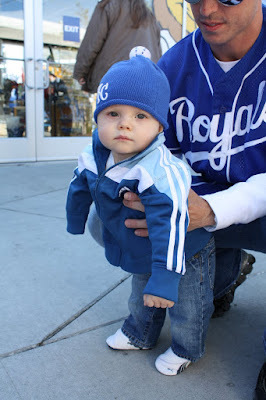 I can just see Jett a few years from now, his glove in his hand, hurrying out the door with DaddyBoy to go cheer on the Royals! It brings a smile to my face just imagining the relationship they will share- all the moments they will make! What a precious day; what a perfect weekend!